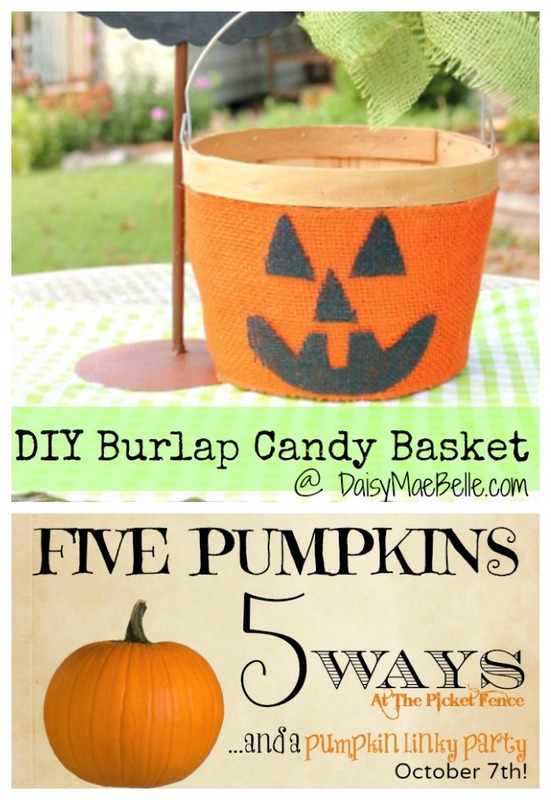 Welcome to our final installment of FIVE PUMPKINS 5 WAYS! We’re so thrilled to welcome Melissa, of Daisy Mae Belle, who is sharing our final pumpkin in the series with us today, a Burlap Pumpkin Candy Basket! Take it away Melissa…. I am so THRILLED to be here At The Picket Fence today! Let’s start this pumpkin fun! Now don’t get me wrong…I have nothing against the traditional plastic candy gathering pumpkins. I carried one myself for years, and it served its purpose well; helping me to collect more than my fair share of candy each Halloween. But, like most of the creative world, I LOVE burlap! SO, if you’re tired of the traditional plastic candy gathering pumpkins, this is just the project for you! Hot glue the orange burlap to the basket. Pull the burlap tight and glue the end of the burlap down. Cut out the face, and hot glue it in place. A big thanks to Melissa for sharing this darling pumpkin craft with us! Have you been following along with us all week? 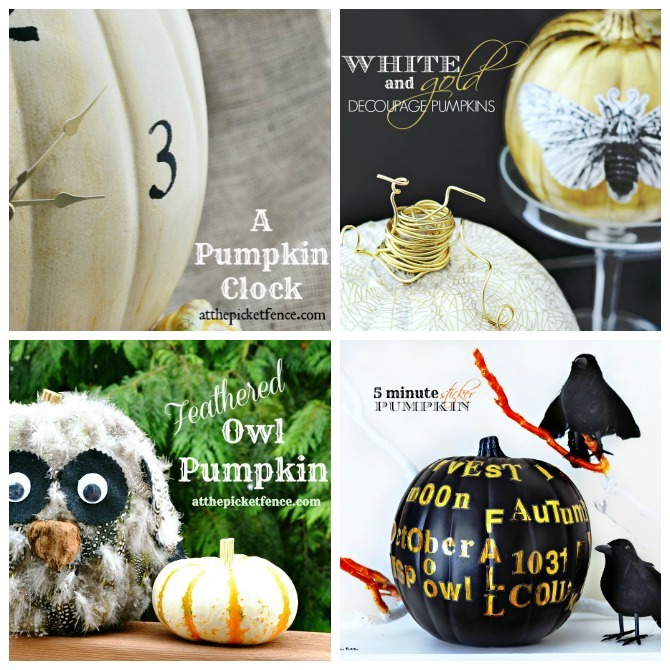 If not here’s a recap of four fun pumpkin projects! We hope you’ll join us Monday, with your favorite pumpkin project, for our Pumpkin Party!! See you then! 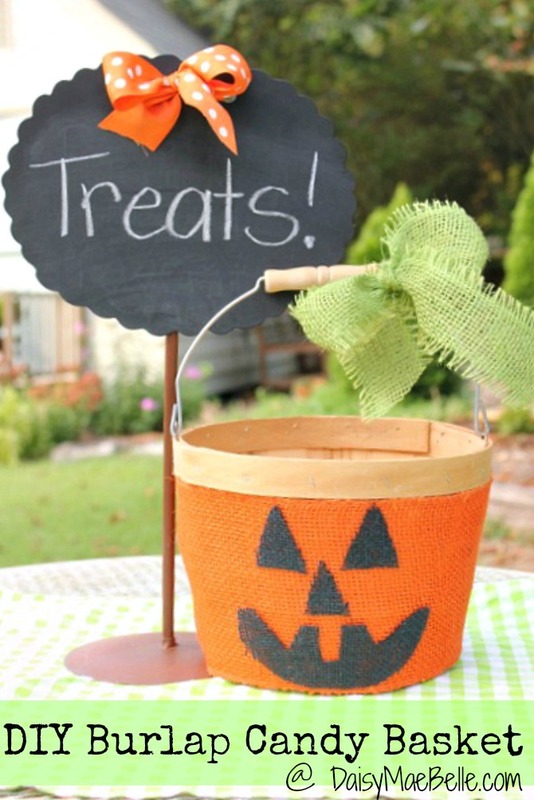 14 Comments on "5 Pumpkins 5 Ways ~ Burlap Pumpkin Basket"
This is adorable! I would have never thought to wrap a basket like that. Can’t wait to make it. Oh how cute it this! Love all the burlap, perfect for fall! What a cute idea! I love anything burlap….especially if it’s orange with a smiley face! You go Melissa! Can’t wait until the Monday linky party! Cute & easy to do! The kiddos would love that. Oh man that is super cute Melissa! What a great little craft. So happy too. Just like you 🙂 Happy Fall and Halloween season. Love it – super cute! I love anything Melissa does! These are SO CUTE Melissa! I need to get some orange burlap STAT! Thanks for sharing!